Hardy kiwis are a sprawling plant that, given time and neglect, can take down a building with heavy vines and fruit. Mine are wispy things that I fear won't survive the summer, much less the winter. 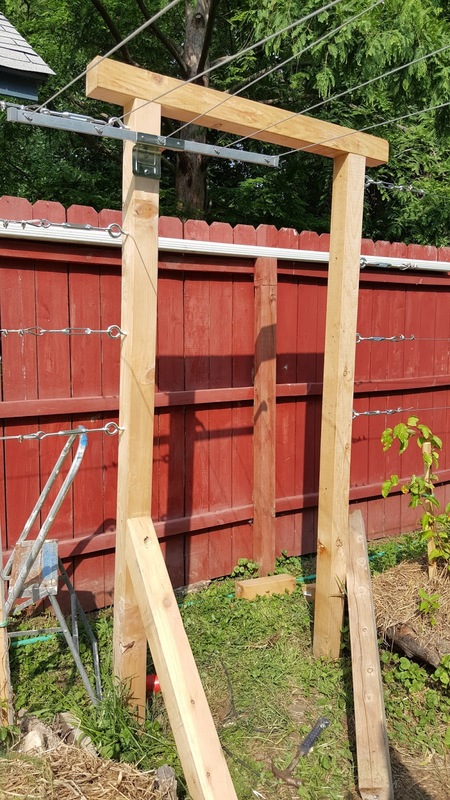 But with faith and a credit card to buy new ones next spring should something die, Jay, friend Dale and I built one heck of a trellis last weekend. 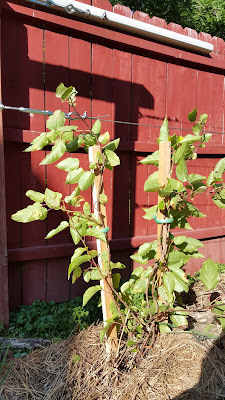 The kiwis are planted on the north side of my asparagus bed. They are in the raised bed because Dale told us they don't like to be in compacted soil, so I put them where they won't be trod over. Using cedar 4x4" posts and fencing supplies from Farm and Fleet, we put together a handsome trellis that should last for years to come. 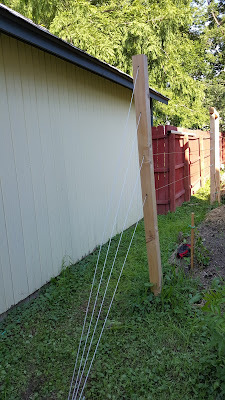 For now, the plants are merely staked, they haven't even reached the lowest wire. As they grow, I will train them along the wires. Kiwis are male and female, one male for up to nine female plants. I have two varieties of females, and each has it's accompanying male. They all flower and smell divinely. This will be an exercise in patience however, it will be some years before we taste the delicious fruit.